On 1st October more than 800 people turned out for a strike rally of teachers in Cambridge, organised by the two biggest teaching unions, the NUT and NASUWT. Almost 100 schools in Cambridgeshire participated in the strike, and were closed or partially closed. 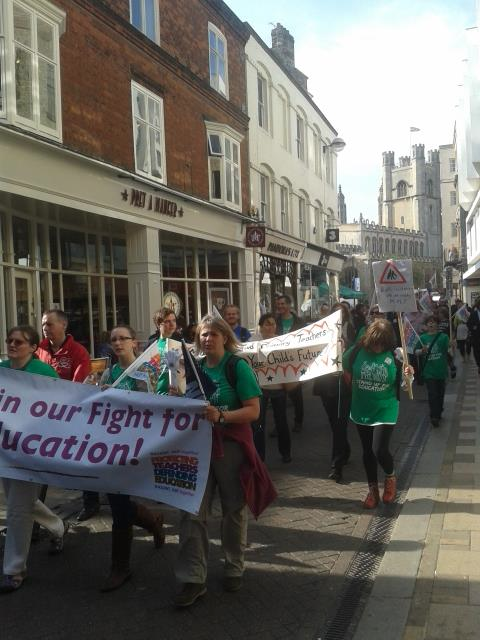 Teachers from different areas throughout Cambridgeshire came to rally in Cambridge, together with their families. Also present were sympathising parents and students. The crowd marched cheerfully from Parker’s Piece, through the town centre, and finally to the Cambridge Union Society building. As a result of the excellent turnout, the Union building was fully packed, and the crowds outside the building waited patiently for the speakers to come out and repeat their speeches. Not only did the national representatives from the NUT and NASUWT give good speeches, but also local teachers spoke about their own experiences, shared their ideas and encouraged their co-workers to fight for change. The 800 people in Cambridge are not alone. In Birmingham, 3000 people rallied, while in Sheffield there were 2000 participants. Strike action took place in the East of England, East and West Midlands, Yorkshire and Humberside. The action is part of a continuing campaign of rolling regional strikes involving members of the NUT and NASUWT against government policies on pay, pensions and working conditions, and also wider attacks on education. The teachers have been constantly under attack by the government, including increasing workloads, cuts and changes to pay and pensions, and job cuts (more details on attacks of teachers can be seen in the article http://socialist.net/teachers-on-rolling-programme-of-strike-action-enough-is-enough.htm). One sixth-form teacher coming on her own from Peterborough said that she feels that teaching as a profession has been under attack ever since she started her job several years ago. The local speakers were talking about how they have to cut down their living standards; how they have to spend a lot of time on paperwork and dealing with bureaucratic procedures; how reluctant they are to accept a performance-related pay scheme as they do not want to fight against their colleagues; and how they have started to doubt whether they should stay in the profession despite the fact that they love teaching. These daily experiences resonated with many of the people on strike. Up till now, in order to fight against these attacks, the teachers have been carrying out a programme of industrial action since the public sector strikes on 30th November 2011, including NASUWT’s ‘action short of strike action’ in which the teachers have been going on strike in individual schools on a daily basis, and joint ‘Rallies for Education’ between NUT and NASUWT for the public, parents, teachers, friends and families. However, these actions have not succeeded in changing the government’s education policy. The furious teachers have therefore started regional strike action, which began on the 27th June in the North West where three-quarters of schools were closed. And this rally was a continuation of that action, which will be followed by strikes in the north-east, south-west, London and the south-east on 17th October. Before Christmas or in January 2014, a national day of action is likely to take place. These actions aim to bring Michael Gove, the Education Secretary, to the negotiating table and ultimately to force him to make concessions on education policy. However, his total refusal to engage with teachers thus far and his apparent contempt for the teaching profession demonstrates that simply hoping for a change in government policy is nothing short of utopian. But far from being a deterrent to struggling against the government, this hostile attitude is pushing the consciousness of teachers in the other direction. Many teachers have realised that the recent strike action is just the starting point of a long struggle. As the national speaker from NUT pointed out in his speech, the next important step is to talk to students and parents to make them understand and support the teachers. A local teacher from a special school correctly pointed out that teachers’ action is in line with the actions to save NHS and all the action by public sector workers. 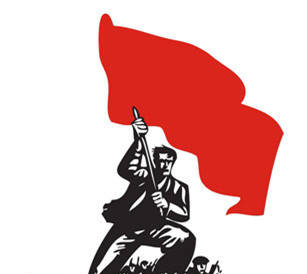 And more importantly, the public sector workers also need to link their struggle to private sector workers, not only because the attack on public sector will affect the whole population, but also the deepening crisis of capitalism has dragged public sector workers into a similar situation as private sector workers. In the fight against the education policies implemented by Gove and the current government, we also need to understand that the organic crisis of capitalism makes it impossible to sustain a well-funded education system which is run by well trained teachers and can benefit ordinary families. Therefore, it is necessary to call for a socialist programme as the only solution to the current crisis in education. As one teacher from Ely pointed out, teachers are facing a contradiction of the capitalist system: between what they are expected to teach students and the reality the students are going to face – they have the opportunity and duty to teach a whole new generation to change society! As university students who are also suffering from the large increase in fees, we are in the same battle as teachers against the cuts to education. We need to show our solidarity with them and fight together for a better education! Moreover, alongside the teachers, we are also in the same battle with the workers to fight against the capitalist system so that we can have good education, good jobs and a good standard of living for all. It is our responsibility to unite our struggle with that of school students, teachers, lecturers and all working people so that our struggle for a socialist transformation of society can be successful.